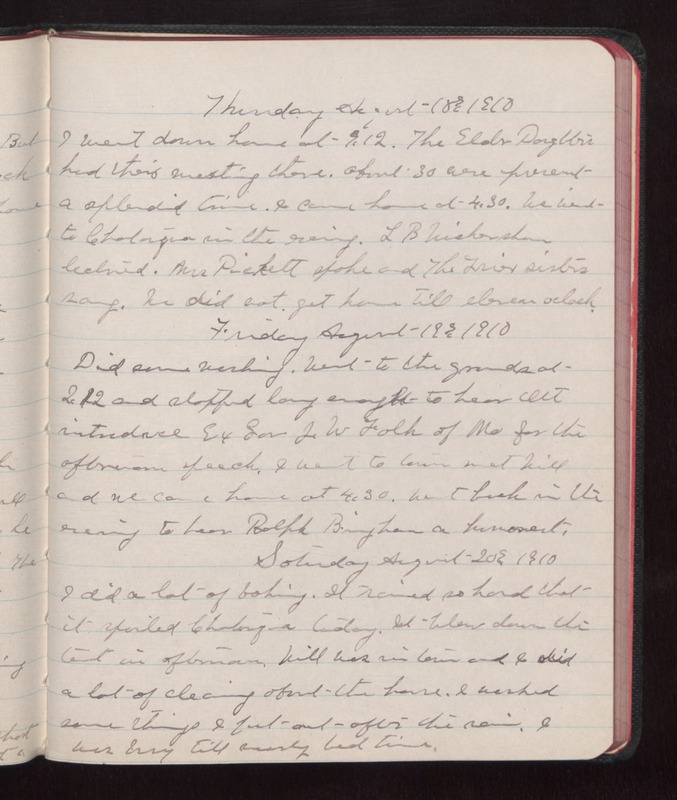 Thursday August 18 1910 I went down home at 9.12. The Elder Daughters had their meeting there. About 30 were present A splendid time. I came home at 4.30. We went to Chautauqua in the evening. L B Wickersham lectured. Mrs Pickett spoke and the [illegible] sisters sang. We did not get home till eleven oclock. Friday August 19 1910 Did some washing. Went to the grounds at 2.12 and stopped long enough to hear Ott introduce Ex Gov J W Folk of Mo for the afternoon speech. I went to town met Will and we came home at 4.30. Went back in the evening to hear Ralph Bingham a humorest. Saturday August 20 1910 I did a lot of baking. It rained so hard that it spoiled Chautauqua today. It blew down the tent in afternoon. Will was in town and I did a lot of cleaning about the house. I washed some things I put out after the rain. I was busy till nearly bed time.